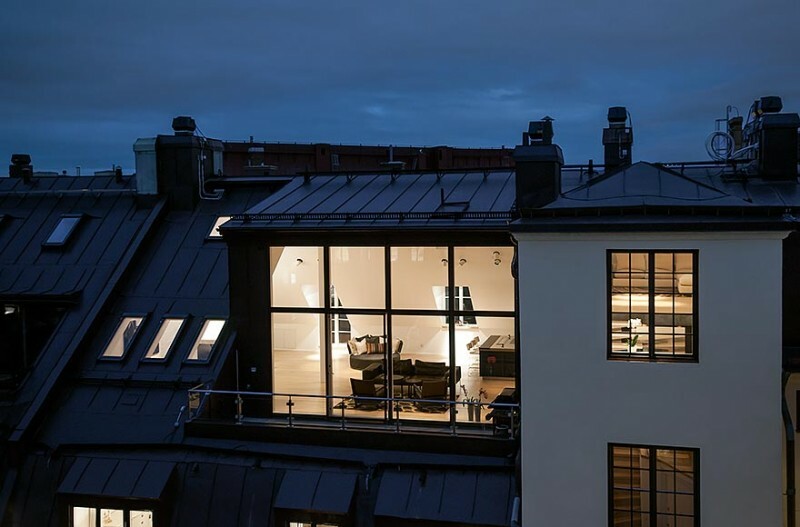 Located near Humlegården, a major park in Östermalm in Stockholm, Sweden, this amazing attic penthouse offers a spacious 2,809 square feet of living spaces. The apartment features four bedrooms, three bathrooms and 19 feet high ceilings at the highest point. 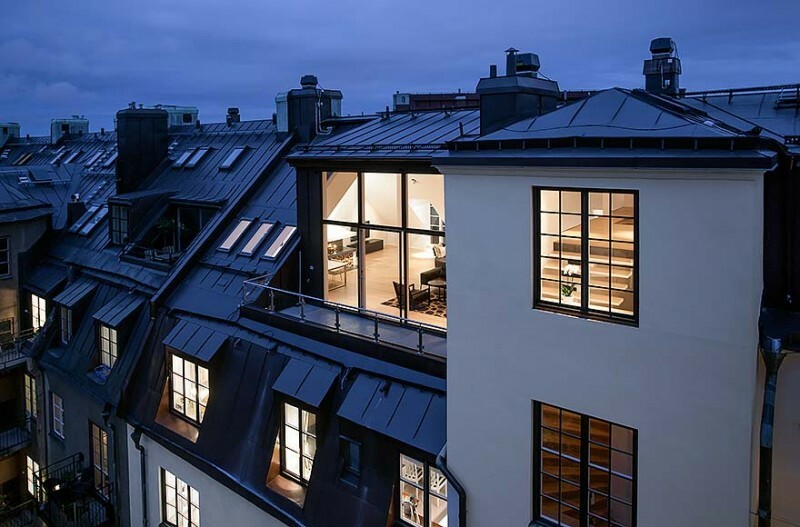 “Near Humlegården Park and the Lärkstaden neighbourhood, well-known Medvind has created this architectural masterpiece of the highest international standard. 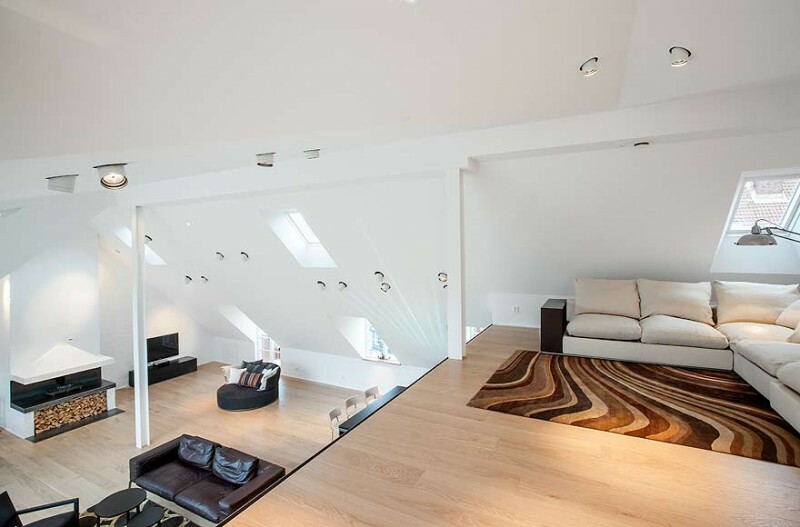 The apartment has 261 m2 of living space, with an opportunity to extend the upper level to reach a total of 301 m2. 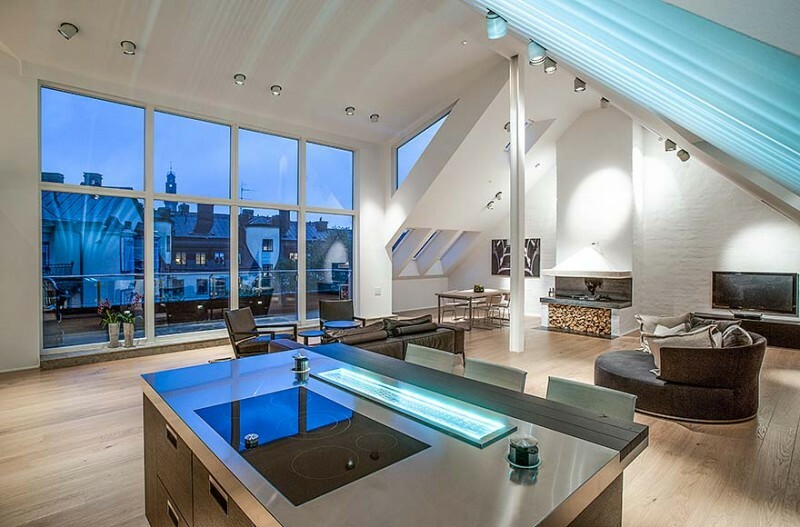 This top-quality apartment lets in a fantastic amount of light through a total of 84 m2 of glass, including 14 skylights, five large dormer window, a Spanish balcony and an amazing seven metres of windows and doors facing the terrace. The lift opens into a spacious hall right in the apartment, near a built-in closet and a guest bathroom in subdued colours. A tasteful stairway leads from the hall up to the second level, which has an awe-inspiring ceiling height of almost six metres from ceiling to floor, and large transom windows that maximize light flow. The layout is clearly divided into a private and a more social sphere. The living room kitchen account for almost 90 m2. The private units, which consist of four bedrooms, three bathrooms, and storage spaces are separate, but there are connecting rooms that encourage communication and togetherness. 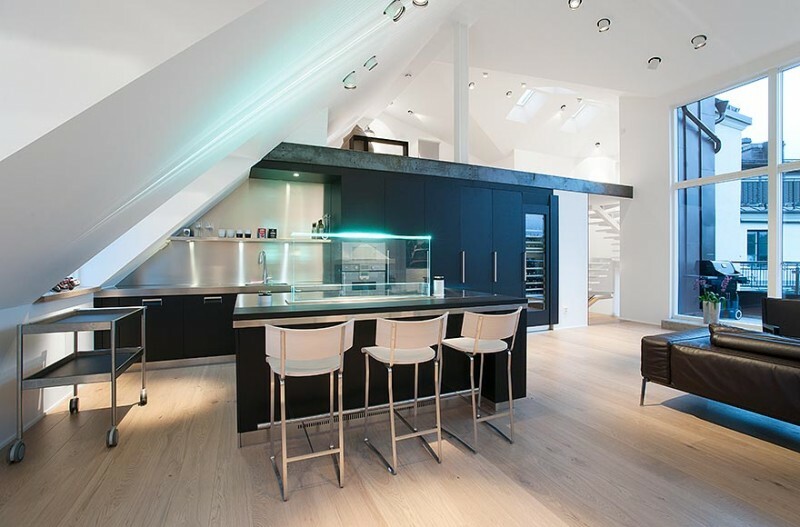 A luxurious kitchen forms part of the open layout with the living room and terrace, and has carpentry by Arclinea, and stainless steel counter and appliances by Gaggenau. The cabinetry is designed by Antonio Citterio, and includes a built in wine cooler that holds 70 bottles, a kitchen island that seats three, and a remote-controlled glass fan. 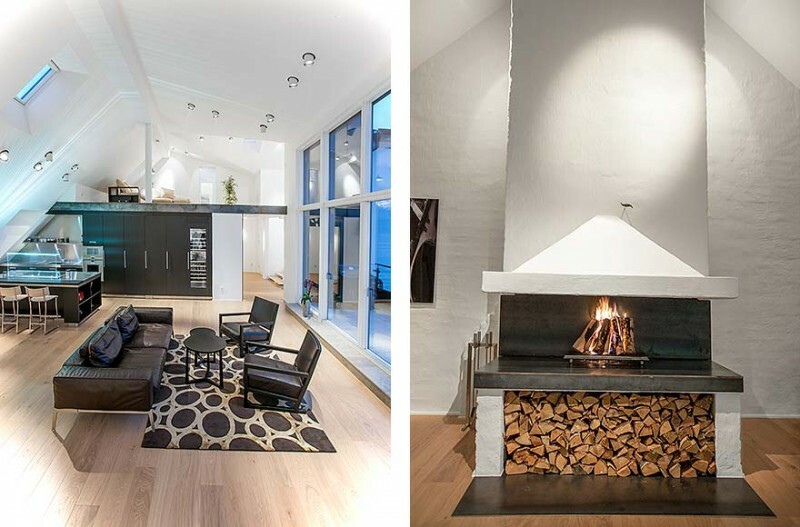 The spacious living room with a designer concrete fireplace reinforces the impression of a modern home. The master bedroom suite is intended as a private unit with a wonderful big bedroom, a walk-in-closet, a spa-like bathroom with a natural stone mini-pool. 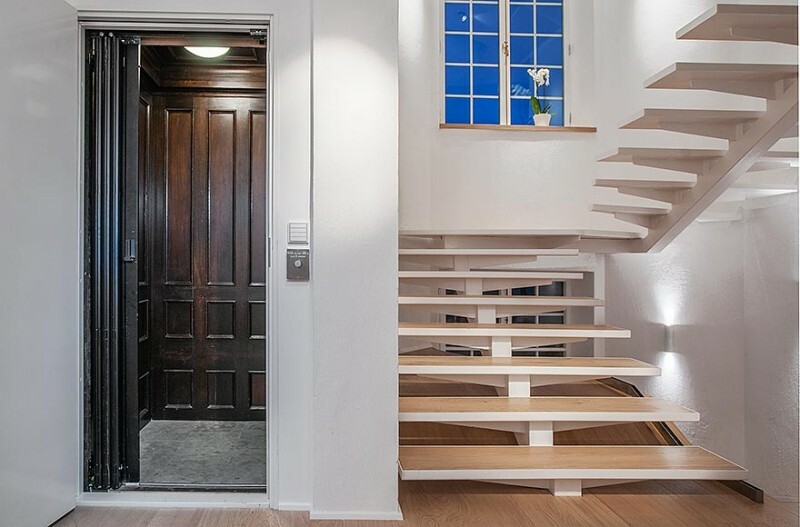 In addition, the lower floor includes two bedrooms, a guest lavatory with shower, and a Spanish balcony fronting on Runebergsgatan, with a lovely view of the city. 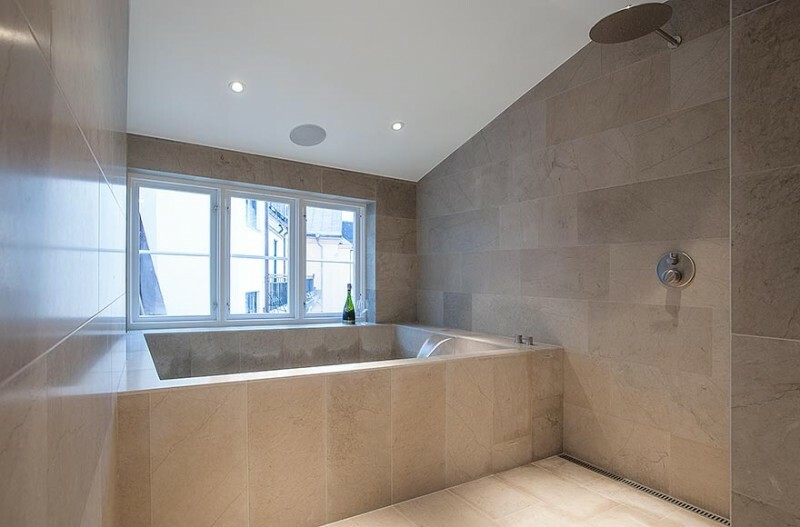 This floor also has a lounge area, a spacious bedroom, as well as a fantastic bathroom with a steam sauna. 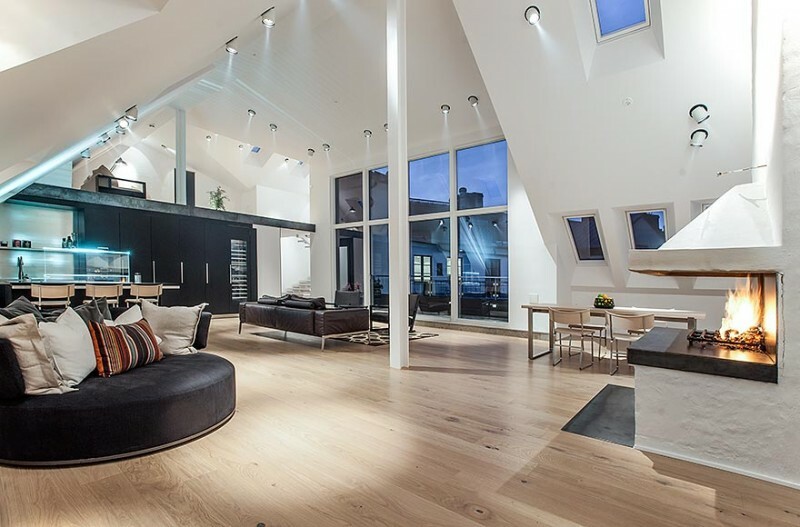 Large open areas and spacious rooms, a voluminous eight-metre mezzanine and a high and unobstructed view describe this home. A fireplace, a lift that take you right into the apartment, a large terrace facing northwest, oak plank floors throughout, spotlights by Flos, waterborne sub-floor heating, (electric coils in the wet rooms), and built-in speakers by Lindh. 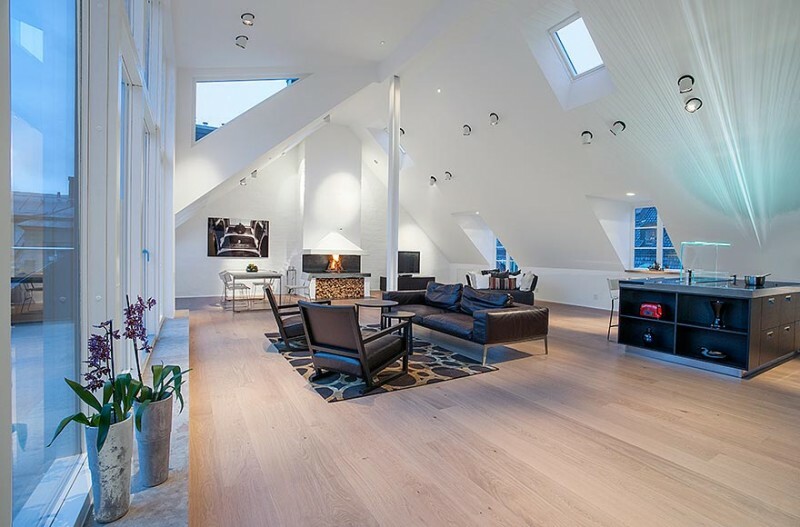 This is an extraordinary home that exudes light and volume from a ceiling height of almost six metres, with glass windows and doors that are just as high and long. This is a perfect layout for both large events and intimate meetings. The craftsmanship and interior decorating are some of the best work that Medvind ever produced.